One of my favorite things about Manu is his ability to make a game his. This means more than just dominating games. Timmy, Tony, and Kawhi dominate games regularly but it always feels like pre-ordained. Manu is chaos. Manu grabs a game’s flow and basically forces it to do what he wants when he wants. When Manu gets on a roll, it’s magic. So yeah, in the fourth quarter of Game 1 of the 2005 Finals, Manu was a goddamn wizard. I was scared going into this series. It was the first time the Spurs were this far in the playoffs where the series was a coin flip. In 1999 and 2003, they were heavy finals favorites. Here, they were playing the defending NBA champs who had the exact makeup to make life miserable for the Spurs. Game 1 was brutal. They fell behind by 13 early and were in a rough tug of war with the Pistons. They were struggling to gain any traction against the Pistons physical defense. Back and forth, back and forth, this game felt destined to be a nail biter and was a four point Spurs lead going into the final quarter. Then Manu decided “Fu@$ it” and removed Detroit from the equation. He did it by furiously attacking the Pistons back line on drive after drive. He barrelled through Ben Wallace and casually laid the ball in like there hadn’t been a brick wall in his way. He swung those elbows viciously on his way into the paint and softly dropped in a lefty floaters. He hit a ridiculous right handed and-1 while being pinballed around the paint on a fast break that had Hubie Brown yelling “oh baby!” (and yielded one of those spastic Timmy fist pumps when he’s really excited.) He glided in for another floater and decided en route to switch it to a dunk just to emphasize the totality of his destruction. Then he capped it off with some smooth setup dribbles on the perimeter and dropped the dagger three over Antonio McDyess. All of the above was in the fourth quarter. It was sudden. It was relentless. It was furious. And Manu made it look so beautiful. All told, he scored 15 points in the fourth quarter in a game where his team scored a total of 84 points. The Pistons had them locked down for the most part and then Manu single-handedly removed the shackles. Manu became a force of nature in that fourth quarter and grabbed the series by the horns. 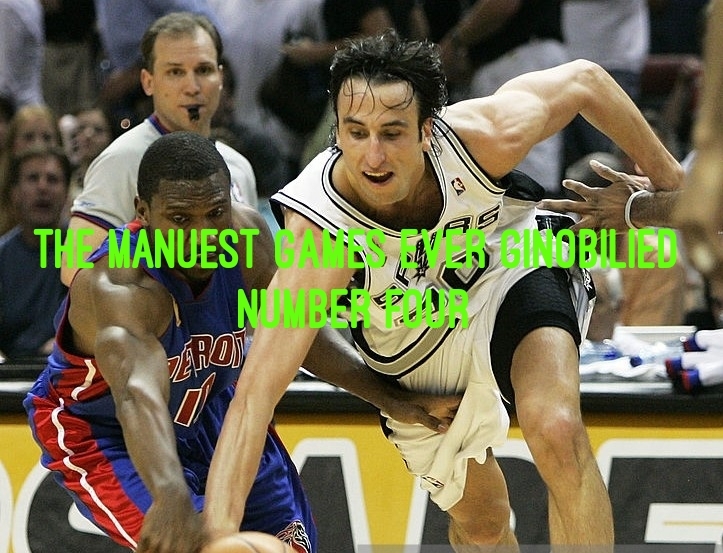 The fact of the matter is that this was the first NBA Finals game of Manu’s career where he was a focal point of the Spurs offense (in 2003 he was a role-player). Very few players can be in that kind of an environment and impose their will. Knowing how this series ended up and how the Spurs needed every edge they could get, Manu’s performance here becomes all the more important.